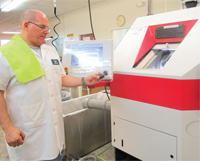 COLUMBIA, S.C.— As published by Vision Monday, Robertson Optical Laboratories, which has been processing free-form lenses since June 2009 through its digital lab in Atlanta (Loganville), Georgia is now producing free-form through its newest digital surfacing lab in Columbia. According to its owners, this is the first full-service, in-house, free-form digital lab in South Carolina. 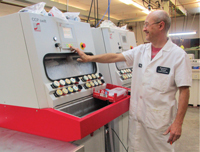 The benefits of this rapidly-improving, cutting-edge technology through Robertson include expedient turnaround, processing efficiency and quality lenses. Because these lenses have digital backside free-form designs, they provide more precise vision, less distortions and clearer, edge-to-edge vision in every viewing zone. The lenses can be personalized to each patient’s individual prescription, frame, angle and vertex. This investment in Robertson’s newest digital surfacing equipment compliments its existing in-house AR and specialty finishing capabilities. 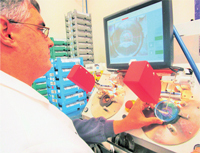 The following free-form PALs can be ordered through any of the Robertson Optical labs and are produced in-house: Coze, Carl Zeiss Vision, Kodak, Seiko and Shamir.Robertson Optical customers and prospective customers are invited to tour the lab and see free-form lenses being processed through this technology at any time by contacting Robertson Optical of Columbia. 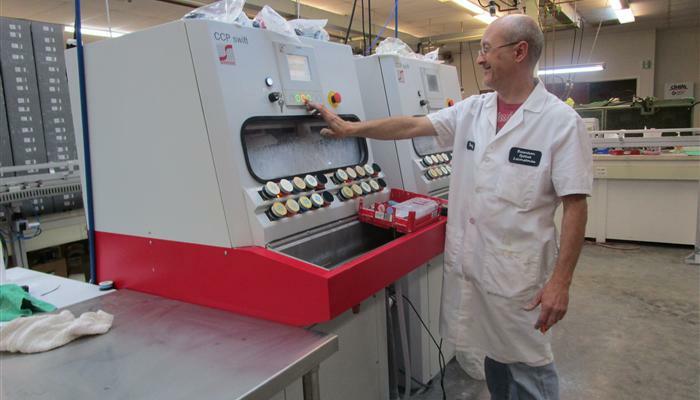 Todd Banks uses a CB Bond-e alloy digital blocker for blocking lenses ready to be surfaced. 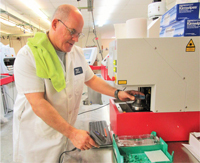 Randy Franklin completes the free-form process using a Schneider CCP Swift digital processor. Joey Byrne surfaces lenses on a Schneider HSC Smart XP digital lathe and then applies laser engravings.